We can even order things using an Alexa device…or, um, “No-Click”? There is a disadvantage to this, though, and I’ve certainly done it. It means that I tend to just order things when I realize we need them…and that realization may come several times in the same day! It might be spread out over days. This means I might have placed several orders in a week, and so, we may get Amazon boxes literally every day, with maybe one or two things in them. What happens is that you designate a day of the week (say, Saturdays) as your Amazon Day. Unless otherwise instructed (which is easy to do), Amazon will group your orders together and deliver them on that day. Even before this was officially released, Amazon says it has saved tens of thousands of boxes. This also has the advantage of you knowing when things will arrive. I will admit to some dismay when a package has arrived a day early: I may have carefully planned the arrival of an item for a day when we would be home (we do have a mail theft issue in our area). This doesn’t affect the Amazon Lockers (which we use a lot…but some items can’t be shipped there, and sometimes the locker is full). You can choose to have a specific item arrive on one of the other six days of the week (to get it sooner, presumably), or switch the Amazon Day when you want. Now, with Amazon Day, we can do it both ways…add things to the Amazon Day shipment (the list equivalent), or have it resolved right away. and other sources, Amazon plans to open a second grocery chain (in addition to Whole Foods) with lower-priced offerings. That honestly makes more sense to me. Amazon has done well with lower-priced (but not bargain) items that do the job but aren’t luxury. They haven’t done as well with the high-end items. It’s also an opportunity for Amazon to really innovate, maybe doing checkoutless stores, such as those with which they have already been experimenting. I don’t picture them as having aisles long enough to land an airplane, like some stores, and a million choices. A smaller selection of high-value items. It’s reasonable to wonder if that would work for a grocery store: don’t people want to get everything in one store? Well, we don’t do that…we shop at several stores. Part of that is being vegetarians; no single store has a great selection. I also think of it kind of like a 7-11, and that’s not meant to be disparaging. It may be the place where you just run in and grab a few things you want (including pre-packaged lunches). there will also be “cameo” appearances by other Dr. Seuss characters, like The Cat in the Hat. That, honestly, doesn’t encourage me…it seems a bit gimmicky. Still, I’ll have an open mind and be hopeful. I had hip replacement surgery on January 17th, and got back to my day job yesterday. The change has been amazing! I’m walking without a cane for the first time in years…I keep looking for where I put it, when I actually didn’t bring it at all. I can also do stairs again, which means I get to rework my paths. It was a lot of work; literally hours every day of PT (physical therapy) and wound care. I’m a very compliant patient…I definitely follow the rules, and I think that helped. I was also in relatively good health for the surgery, and a newer technique was used (the direct anterior approach with the Hana table…don’t look up videos if you are squeamish, but it typically shortens recovery time). I thought I would get more reading and writing done, but that work was disruptive, as well as taking naps (which they said would happen). I don’t feel chronic pain much, so I (with the agreement of my surgeon) only took a half a pain pill the first night. I did get some pictures digitized…I’ve been meaning to do that. What do you think? Are you looking forward to the new Dr. Seuss book? Do you like character cameos in books? What would get you to go to yet another grocery store? Does Amazon Day sound like something you’ll use? Feel free to let me and my readers know what you think by commenting on this post. I had hip replacement surgery on January 17th, and that’s why you’ve been seeing “reprints” (re-posts, actually). This is the first fresh thing I’ve written for the blog since, although I’ve been tweaking the Bookish Birthdays. Knock virtual wood, it’s been going remarkably well! I don’t feel pain much; that’s nothing of which to be particularly proud, it’s just a thing…like being tall. Since the surgery, I took half a Norco and a Celebrex (I took the latter because I thought it was more for swelling). This is all with consultation with my surgeon, and those are all the pain meds I’ve taken. I am taking aspirin (81 mg twice a day), but that’s to lessen the chance of blood clots…so I take it for six weeks. 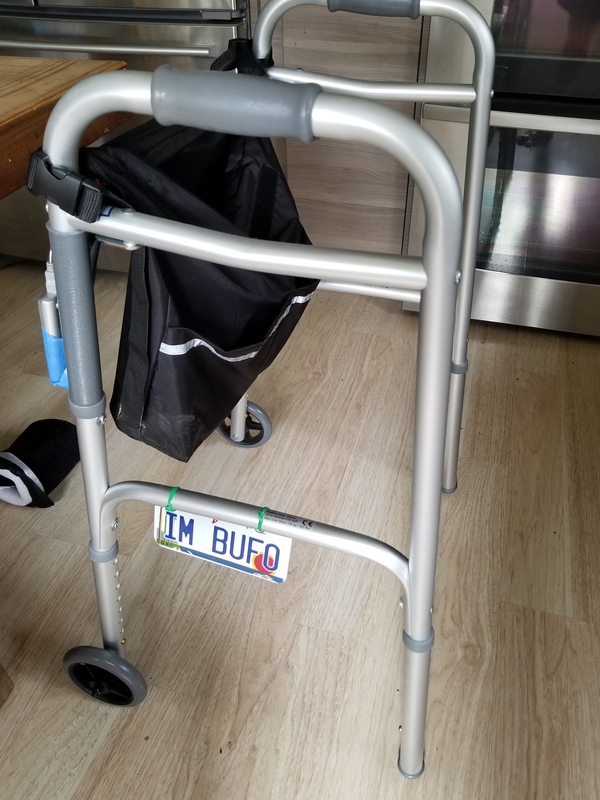 I’m up and around with the walker…that “license plate” was a gift from our adult kid for my wheelchair. I used to have a personalized one like that on a car I owned, so I thought that was very thoughtful! I’m actually sitting at the kitchen table right now writing. The first day or two, I didn’t get out with the dogs, which was very hard for all of us. Now, I can be out here, but I have to be constantly aware. That’s the weird part, and where my lack of feeling pain is a disadvantage: it is quite possible to dislocate the replacement at this point. There is bone growing, which will take a long time…my leave is set for seven weeks. I read a lot and watched a lot of videos, so I have a good idea what not to do. It’s some weird things; if you turn 90 degrees, most people leave one foot still pointing forward, so it ends up perpendicular…and then, pop! So, I have to take little steps, like an eighth of a circle at a time. I was referring to that as my “Arte Johnson Shuffle”, for the old man character (Tyrone) Arte played on Laugh-In who took very short strides. So, a moment’s inattention could put me back in the Operating Room. which has been simply amazing! Even though my Significant Other (ironically) doesn’t like tech much at all, we got a second one…my SO doesn’t thumb-type well (neither do I), and although it won’t be used much, it will make a difference. The thing that convinced me? Adding items to the Alexa shopping list. Yes, it could be spoken, but my SO also doesn’t like to talk to tech all that much (but will set timers and play music with Alexa). That seems like a little thing, but my SO doesn’t like cords showing. This thing is vertical: sort of looking like a Coleman Lantern. You can wind up the main cord inside it. You can also turn outlets off on and with a button. Each outlet is plenty large to handle the biggest wall adapter I have, and it has USB ports. When I’m not using it, it sits very nicely on a window sill. in the bedroom, but it was just easier to use the phone (the Spot is on the headboard). Would it have been easier for me if it was the other way around. However, I didn’t want to change the arrangement. That would be harder on my SO, and I didn’t mind having the motivation to get back in the family room. The cube controls our TV; in the bedroom, I have a remote. Okay, with the free trial and $7.99 a month (+tax), it’s not much of an indulgence. 😉 They have quite a few older series, which is what I wanted to watch more than the new shows (I like non-dark DC better). I may write a whole review in the The Measured Circle, but I will say that the interface is a bit clunky. It doesn’t always start (meaning I need to force stop it in the Applications part of the Settings on the Fire TV), and it often doesn’t realize I’ve already seen an episode, but the content is worth it to me. Oh, and of course, I’m reading! I do it on a Paperwhite & a discontinued Kindle Fire HD tablet. I got a few books at the holidays, and I’m enjoying that, plus magazines. I may do something different on that, but this is long enough for now! Now, on to other things! While this is something which may be wonderful, and we may literally get anecdotes about it saving lives, Amazon has to be very careful with something that you can request now (although that doesn’t mean you automatically get it). it will do a number of things, including switching lights on and off when you are away so it appears you are home. I think the standout feature (at least right off) will be its ability to alert you when it hears troubling sounds…breaking glass, smoke alarms, that kind of thing. While that’s undeniably a good thing (assuming there aren’t too many false positives), it does change a fundamental thing about your Echo device that Amazon has said many times. It will now be responding to something other than the wake word…and presumably, recording audio. I don’t know that, but I assume it will record some audio when it hears something “suspicious”, than play it for you remotely. That way, you can assess the actual danger. I can think of many false triggers…you could be watching a show which has breaking glass, and that’s part of some ceremonies which have been in the movies/TV. I’ve already requested it myself. If you want to do that, go to the settings in your Alexa app. If you are eligible to request it (I think that depends on the kind of hardware you have), you’ll see a listing for “Guard” most of the way down. Once you’ve done that, you are on the list, and they’ll let you know. Jeff and Mackenzie Bezos have been getting a lot of coverage recently in somewhat unusual places, due to their announced change in relationship status. All I want to address (briefly) is how this might affect Amazon and us as customers. There seems little doubt that Mackenzie will get credit for her participation in the foundation and at least the early years of Amazon. It is certainly possible that Jeff will lose some power with the company (and Mackenzie could gain it…getting stock, perhaps), but I think that will be handled in a way that doesn’t hurt the company. One choice might be a buy out: cash value instead of the stock. Another might be some sort of non-voting stock. The key thing in terms of continuity is that Jeff’s position as a stockholder is essentially unchanged. That may not be what happens, though. Who’s going to save small and medium businesses from Amazon? How about Amazon? There is a lot of data in the press release, all indicating how powerful Amazon has been for small and medium businesses lately. One interesting thing: they said that they thought small and medium businesses selling through Amazon created 900,000 jobs worldwide. I’ve talked about Amazon wanting to be the “infrastructure of the internet”, and these are sales made through the internet (even though Amazon pointedly refers to “stores” rather than “sites” throughout the press release), but of physical objects. In the past, people have sometimes wanted to know what I’ve chosen. I’m going with bestseller Barry Eisler (not the only bestseller on this list) and Charlie N. Holmberg (author of The Paper Magician). While Blood for Blood says it’s a mystery, it sounds pretty violent, which isn’t always something we like Sure, Eisler is probably violent, too, but that goes better with “thriller” than with “mystery” for me. This came up for me on Twitter recently (I’ve been a lot more active there of late), and I thought I’d share my thoughts on it here. Someone was asking how they could write about flirting when they never flirt. My definition of “empathy” is being able to tell how people feel (or how they will feel in a given circumstance). I considered it an essential quality when I was hiring trainers. A successful trainer has a lot of empathy…even just preparing material, they can tell what is going to be difficult for someone to understand. They can figure out for which things they will need to use more real world analogies, for example. When doing the training, they need to be able to have a sense of the room…are they going too quickly? Are they going to slowly? Sympathy, on the other hand, is related to feeling the same way as someone else…nowadays, that usually means feeling their pain or suffering by realizing how something is going to affect them. Those two are very different. It would be possible for someone with clinically no sympathy to be a successful trainer. They would need to see the value in getting people to understand, but they wouldn’t have to feel bad for someone who wasn’t. On the other hand, someone with no empathy would likely be a terrible trainer…they couldn’t adjust as needed based on the emotional state of the students. They need to be able to imagine how someone would feel. Let’s say someone is writing a very violent character when they themselves are non-violent (the “pacifist” in my tweet above). They don’t have to align their feelings with the character…they don’t have feel what they feel. They just have to imagine how that person would feel. That might be by equating the joy of the violence with, say, the joy the author felt in winning a tennis game…but there need not be a personal analog at all. What do you think? Would you use Alexa Guard? What would you want it to do if it hears a sound…remember that it has directional hearing? Maybe it could just take a picture of that area (if pointed that way)…maybe it could lock the doors, turn on your Ring camera to record anybody near the front of the house, or yell, “Intruder alert!” What’s your scenario for Amazon’s first big bad PR out if it? Do you have any concerns about Mackenzie and Jeff’s change? Do writers need to feel sympathy, or just empathy…and is that how you use the terms? Is it possible to have one without the other? Feel free to tell me and my readers what you think by commenting on this post. I’m scheduled to have surgery in the morning of Thursday, January 17th. My left hip is being replaced, using a direct anterior approach with a HANA table. If you don’t know what the latter is…well, you can see videos on it pretty easily, but I wouldn’t do it if you are squeamish. 😉 I’m fine with all of that, and I’m not concerned about the surgery…I’m probably at bigger risk on the road to the hospital than the surgery itself presents. There is a risk, of course, and I’ve used this as a specific impetus to get things in order…increasing my life insurance, refreshing my will, doing donations of books, that sort of thing. Nothing I shouldn’t have done before. I’m surprisingly comfortable donating the books: I had always imagined they would be donated after I died, but that would be a giant burden to my survivors…and we might as well get the tax write-off now. Even if things go as well as the odds would say (I think I’m in relatively good shape for the surgery, but my arthritis is particularly bad…I’m at the highest level), I doubt I’ll be able to write right away. They do think I’ll get home the same day…I’ve worked with medical people for a very long time, and quite legitimately, people who can do so heal better at home than in the hospital. However, everything I hear says they’ll really want me on serious pain medicine at first. As a quirk, I don’t feel pain very much generally, so I don’t tend to take as much pain medicine as most people. People who have had this done, though, tell me I really should take it for as long as they say (3 days? A week? I don’t know yet). I may not be able to write under its influence…and if I tried, I can’t be sure about what I’d say. 😉 It might also really change my sleep patterns. To prepare for that, I’m going to schedule posts for each of the days of the week after the surgery. That will be in addition to the Bookish Birthday posts, which I’ll also schedule. They’ll probably all be reposts, but I think you’ll find that interesting…sort of a “best of” series. Just wanted to give you the heads up. I’m actually hoping that, after recovery (they figure seven weeks before I can get back to my day job…that’s average), I’ll be back to doing more narrative writing in this blog. I haven’t been able to get around much, which you would think would give me more time, but the reduced function…complicates my “activities of daily living” considerably. During the aftercare period, I’ll probably have quite a bit of physical therapy. Our adult kid and Significant Other are also going to come visit for about a week. Even so, I think there’s a chance I’ll be able to write quite a bit before I can get back to work…here’s hoping! Thanks to all of you! I’ve been writing this blog for more than nine years now, and I’ve really enjoyed the intellectual exchange with you. Everyone of you that I’ve helped in some way has really made this all worthwhile! This is one in a series of posts which I write about once a year. I do this primarily to give my readers some ideas they might use to get more out of their devices. I also think it’s interesting to go back and look at the previous ones, to see how much things have changed…the biggest device changes this year had to do with introducing the Echo Spot (at AmazonSmile: benefit a non-profit of your choice by shopping) at work and the Fire TV Cube (at AmazonSmile: benefit a non-profit of your choice by shopping*) at home. Okay, let’s start a typical weekday in the Life of a Kindleer. I wake up between about 2:00 and 3:00 AM…sometimes closer to 1:00 AM, sometimes a little later (but I haven’t slept past 4:00 AM in years). As I explained last year, it’s not from an alarm or anything, it’s just my habit. I’ve had it checked out medically, and it seems to be fine. Asleep at about 9:00 PM, up at about 2:00 AM…that’s between five and six hours usually. I also may fall asleep out on the couch maybe around 7. I don’t fall asleep during the day, by the way! I also pick up my Galaxy S8, which is next to the bed, too…face down. It’s there as a back up. There is an alarm set on it for 5:00 AM, but I never use it…I let it go off, mostly as a reminder that it’s getting to that point in the morning. It used to be because my Significant Other was going to leave then, but my SO has retired since the last time I wrote one of these. read. That’s a big part of my morning, not just for myself, but for flipping articles into my free Flipboard magazines, including the ILMK magazine at Flipboard. A change since last year: I don’t turn on the lights with my phone, I do it manually. At one point, my Wink hub just stopped working (I think it was updated into obsolescence), and I haven’t connected my lights back to my Alexa. My SO never liked using Alexa for the lights. Also, I talk a lot as a trainer during the day, and I know how to take care of my voice. I hum and do vocal warm-ups before I do much talking. Next, I head out to the family room…and one of the dogs gets off the bed to come with me (I love hearing the dog do the shimmy, then land on the floor). The other dog is often already in the family room. They aren’t as habit-based as they used to be as to where they sleep, though. is also in a sort of sleep mode, but still displays the time. I think it senses I’m moving around out there and wakes up. 🙂 When I’m not reading during the first part of my exercise routine (I exercise for about 45 minutes before I go to work), I glance at it. I really like what shows up on the display: the first event on my calendar, the weather, but also headlines. After I’ve fed the dogs, I’m doing that exercise and reading Flipboard on my Kindle Fire. and the IMDb app (IMDb is owned by Amazon). Whenever I’m going to head back for my shower, the more intellectual of the two dogs has a very cute “trick”, and this is my SO’s favorite thing of the day. I say, “Wake up call!” I open the door, and the dog (all 14 pounds) leaps on the bed and vigorously licks my SO in the face! That’s where I’ve been watching Kung Fu. 🙂 I also listen to my Flash Briefing, but only part of it…not enough time. for the first time. It’s interesting: I try really hard to avoid spoilers, but of course, I knew something about the story. I thought it started out slowly…there was a lot of world-building. However, I can see how that would have unfolded effectively for someone who went into it with no knowledge. Once we got past that and we got more to the individual story, it was much better. I have to say, by stopping where they did when they adapted it for Field of Dreams, it’s a brilliant adaptation! The rest of it was good, but I think they made it a much better movie by sticking to “Act One” (or maybe the first inning, in this case). If my SO has gone to the gym, I’ve been having some fun recently having the FTVC play music. That way, when my SO comes home, there’s some theme of music playing. However, that does mean that I don’t use Prime Music at work any more. We don’t pay for Amazon Music Unlimited, so only one stream of music can play at a time (although it could be on more than one device at once). At work, I’ll use Google’s free music…it has some interesting songs, but I can’t get it to just play the artist I want, like I can with Prime Music. I don’t like to listen to an audiobook unless I’ve already read the book (which I have here, more than once). The book is astonishingly good…very complex, with multiple scenes, many characters, and clever foreshadowing. Even though I’m a big fan of Tim Curry, the acting doesn’t help the story at all for me…I would have preferred text-to-speech. That’s a great work companion! I play Jeopardy while my work computer boots up and I get set up. It’s so much better to be able to read the question (on the Spot’s screen) rather than just hearing…it’s more like the show. I don’t always get them all right, but I’m usually top 1%. I also sometimes listen to my briefing (I’m a bit of a news junkie), set timers, and so on. On the way home, I may listen to the book more. It depends on the distance (I work different places). I don’t usually start up the book for a short trip. It the trip is going to be at least half an hour, I’ve recently been listening to Old Time Radio. I haven’t found a good Alexa Skill for that, so I use an app on my phone called Old Time Radio Player. I’m listening to Inner Sanctum, which I really enjoy! Raymond is a punny host, making lots of jokes about murder and the undead, not unlike many TV Horror Hosts. The writing is good, and many famous actors appear. Be aware that it can be really creepy! I may also listen to the Flash Briefing…and that can last more than half an hour. At lunch, I’m usually in virtual reality doing floor work…that helps with my chronic condition. Oh, and I might as well tell you now: I’m going to have major surgery, probably in January. I think I’ve said it before: I have an arthritic hip, and I’m at the most severe level. I’m really excited to be getting a new hip! My impression is that it shouldn’t make me miss much writing during the recovery period, and in fact, I may get more writing done. When I’m home, we usually watch Hulu for those competition shows. Counting the weekend, we may also watch Hulu, Tubi, news apps, and HBO on DirecTV Now. I’ll also write for sure! I’m still re-reading the original fourteen Oz books. That’s basically the weekday routine. Hope that helps! If you have questions or comments, feel free to let me and my readers know by commenting on this post. For just about as long as I can remember, I’ve defined myself in part by the books I own. Not just the books I’ve read: arguably, the books you read can truly shape who you are. No, by the books I own. Most of those are also books I’ve read, and I don’t own books with no intent to read them ever, but having them has been part of my identity. I’ve often mentioned in the blog that I have something like 10,000 p-books (paperbooks) on shelves in our home. I’ve recently been rethinking my scenario. I had always pictured that I would keep accumulating p-books until I died. Then, they would be donated. Much of what I have would be considered ephemera…something with no lasting value. I didn’t know who would want to preserve, catalog, and share my books…I didn’t think that through enough. I considered myself a preservationist: it wouldn’t surprise me if I have one of the very few copies of some of the works I have…some were basically self-published, and again, were never popular. We have had a big change in lifestyle recently, and that has gotten me to re-evaluate a number of things. I can tell you, it would be a burden on our kid (or whoever dealt with the estate) to figure out where to donate the books (and they wouldn’t have a whole lot of value). I’m sure the “next generation” wouldn’t want to keep them…houses in the future won’t even be built with the idea of massive bookshelves (which were initially actually part of a plan to sell more books). It also seems…selfish to keep them just sitting on the shelf when they could benefit other people the way they have benefited me. in person for the first time (I did the donation before that), and that meeting really reinforced my sense that things I donated to the ICM would be respected. If that’s the case, isn’t it better for the world that the books go to someone who will do with them now what I wanted someone to do with them after I died, however many years from now that might be? We could also use the tax write-off, small though it might be. 😉 Refining the house is also something we are doing now: straightening things, streamlining, and doing some redesign of display. It’s not in the current version showing there, by the way…I saw it at a special event in San Francisco. So (deep breath), I’m going to start looking at things to donate. for purely UFO items, and I’ll consider that. I hope to find a place for pop culture items which don’t fit my “Bufo’s Weird World” materials. I have a Buckaroo Banzai jacket, a promotional radio record for Blazing Saddles, that sort of thing. If you have a suggestion for an established non-profit (where we can get the tax write-off), I’d be happy to hear it! I’m sure I never would have gotten here without the Kindle and e-books. We do have over 3,000 of those, and our adult kid is on our account and will therefore have access to them after I’m gone…and they won’t be any kind of burden. Am I going to get rid of all my p-books? I’m not sure…my Oz books would be tough to do, and books I’ve owned since I was a child, or that were written by people I know…hm, I’ll think about it. What about you? What is your strategy on your p-books? Have you already reduced your library? Did you donate them? Sell them? Give them away? Do you have a post-mortem library plan? If you inherited a lot of books, what was that experience like? Feel free to tell me and my readers what you think by commenting on this post. Happy my birthday, 2018! I’m giving you presents! February 12th is my birthday, and continuing a tradition, I’m giving you presents! This is to thank you for making another year of my life richer. I have a lot of fun writing this blog, and I sometimes get to help people…and what could be better than that? I have asked Amazon to make them free on February 12, but I can’t say exactly when it will happen. I think they may also only be free to customers in the USA. Some might be fun to give as a little Valentine’s Day present…for somebody on your account. I don’t think you can get them for people not on your account through this one-day promotion. When this one was first published in December of 2012, it was the number one bestselling book of quotations at Amazon…including paper! That didn’t last long, but it was fun while it did. This is the first 101 posts in this blog. I did 101 posts so I wouldn’t cut off Doctor Watson’s Blog: A Kindle Abandoned (which is a four-part story). Feel free to spread the word on these freebies…there’s no limit, as far as I know, to the number I can give away on this day. This one is a “big” birthday, so people have been asking me if I’m doing anything special. I’m not, really. 🙂 I’m not at all ashamed of my age…I always figure every of those years helped me become who I am. I don’t mention it on this blog, because I like people to feel like they can comment here with no need to identify themselves by intrinsic characteristics. I did take the day off of my day job, and I am getting my annual check-up. I like to do that on the actual day when I can. It won’t be my best check-up…my chronic condition has deteriorated noticeably (I’m getting a disabled placard for the first time from the DMV…I won’t use it most of the time, but I can’t do stairs, and sometimes, the special parking places are the only ones without stairs). I’m just about recovered from that nasty virus, but I still have some symptoms. I’ve also gained maybe ten pounds of unhealthy weight, but I’m still in pretty good shape. I’ll lose that weight…I’ve been indulging myself a bit while sick (which for me means things like eating two apples in a day instead of one), and I’m having to rework my exercise regimen because of decreased capability. However, I do still exercise on average about 90 minutes a day. I am more aware of my mortality, though, so we are doing something special…we are getting a Safe Deposit Box. Even though that’s sixty dollars a year and our income was recently reduced, I think it’s worth it. The big thing that will be in there will be a way to get into all of our accounts…our now adult kid will have access to that if we die. That’s what I figure will preserve my writing, and our Kindle library. I have a thing that I write on my own time, but I publish at work (I own it…I don’t do it for work), which has to do with celeb birthdays. People seem to like it, and after I have a solid year’s worth, I may do something else with it. For fun, though, here are some other people born on my birthday…how many can you identify? Happy February 12th birthday to Radric Delantic “Gucci Mane” Davis, Tara Strong, Mike Posner, Bill Russell, Jennifer Stone, Charles Darwin, Christina Ricci, Jesse Spencer, Scott Menville, Josh Brolin, Aaron Sanchez, Arsenio Hall, Louis Renault, Anna Pavlova, Lincoln LaPaz, Wallace Ford, William Collier Jr., Ted Mack, Joseph Kearns, Gordon Lee “Tex” Beneke, Lorne Greene, Forrest Tucker, Franco Zeffirelli, Joe Garagiola Sr., Charles Van Doren, Vince Montana Jr., Costa-Gravas, Annette Crosbie, Gene McDaniels, Ray Manzarek, Ray Kurzweil, Michael Ironside, Simon MacCorkindale, Joanna Kerns, Joe Dever, Chynna Phillips, Darren Aronofsky, and Judy Blume! I had somebody at work ask me why Abraham Lincoln isn’t on the list…it’s because it’s a work thing, so I try not to list people known primarily as politicians…it’s just less controversial that way. Have a great day…happy my birthday! There are many people who have much worse situations, even in this country, just in the past twelve months. I was peripherally involved with the Santa Rosa fires in Northern California, for example. We did donate as well to hurricane relief…we like to help when we can. Up until a few minutes ago (around 9:00 AM Pacific), we had been without the internet at our house since about 5:00 PM Pacific Thursday night. It doesn’t just mean that we can’t visit social media. No TV. No phone. No internet. It meant that I “missed a deadline” yesterday, although it’s only my deadline to do a Bookish Birthday every day. I’ll do the one for yesterday today…I do have a lot of catching up to do! I could just let it slide, but it will be easier next year if I already have it done. That was frustrating. Now, an obvious question is why didn’t I just go somewhere else to use the internet? I had to be home for the cable repair person. When my Significant Other (SO) called Friday morning, they gave us an appointment for noon on Saturday. I didn’t want to take a chance that they would call and say they could show up early, so I didn’t leave. I checked online how long the window would be for an appointment (I’ll explain how shortly), and it said two hours. Well, they hadn’t showed by 2:00 PM yesterday. I was able to go out on the street and get texts (and that’s how I checked the appointment window, but that type of search was very spotty), so I texted my SO who was at work. My SO called…and they said that because it was an outside line, not the house, it was a twelve-hour window from 8:00 am to 8:00 pm! Might have been nice if they’d told us that at first, but I would have been okay…if they showed up at all. My SO is retiring Friday (January 12) and is reasonably at the office both weekend days this weekend, helping prepare the transition for the office (my SO is a swell person 🙂 ). That’s why I had to be home to meet them. When my SO called this morning, they said that our appointment was canceled yesterday (no techs available), but they didn’t have a phone number for us, so didn’t let us know. This is despite that they get a phone number from us whenever we call them, and I would bet it’s on the account somewhere…I haven’t checked for sure yet, though. That’s frustrating (even though I’m a very calm person…it was frustrating in the sense of stopping me, and yes, I had some emotional reaction to the whole situation). I could have gone to my office yesterday and worked if I’d known. The tech showed up this morning at about 8:00 AM, and zap-zoom, it was done in under half an hour! It still showed the time. 😉 Our cable box didn’t, by the way. One weird thing is that it continued to show the same calendar reminders, which in this case, happened to be for medication for the dogs (they get monthly meds). It kept telling me that it was due “tomorrow”. Since I alone give the meds, to avoid any confusion, there wasn’t any risk…but I can see situations where it could have been a problem. A really nice thing it does, though, is show an orange line at the bottom of the screen when it doesn’t have internet…that was my canary in the coal mine for status. What did I do for a full day without the internet? I finished several issues of Fortean Times, which I read on the Zinio app on my now discontinued Kindle Fire HDX 7. Fortunately, I had already downloaded some. It is consistently the best writing I read, including books. I did read books. While I keep almost everything in the cloud, I do always have some books on my Fire (and on my Kindle EBRs…E-Book Readers). I keep a couple of long “emergency books”, just like I used to have p-books (paperbooks) in the car and on my person. I would go out to the end of the block (but I could still see the house, in case they showed up) and I could get a couple of bars…not enough for some functions, but it would pick up my e-mail that way. Text always seems to be the easiest thing to get, and I sometimes got those in the house. I think that gives you a pretty good sense…and I’m starting to feel more normal again. Oh, I did want to talk about Friday morning! When the internet went out on Thursday evening, I assumed it was just an intermittent outage. We did get the house rewired in 2017 which was supposed to limit those, but the weather hasn’t been great, and I thought it might be connected to that. When my SO was leaving for work, it was a boomerang exit. I was told there was a cable down. I went out to look, and yes, a line at least 15 meters (50 feet) long was down…and it crossed in front of our driveway. My SO parks at the curb, so could leave without touching it, but I couldn’t. I had my SO drive far enough away to get a phone signal, and call PG&E (Pacific Gas & Electric). I wasn’t positive it wasn’t a power line, or that it didn’t also indicate that a power line was compromised. We asked about public safety and we were advised that I should keep people away from it until they got there. So, I stayed outside…in the dark…for about an hour. I could grab some supplies and still see the street (we “stage” our dog park trips in the entryway). As a geek, I was very happy I had a small “emergency beacon” flashlight that I could put where the end of the cable was. I have exceptional night vision (I think that’s connected to my color vision deficiency), but my SO doesn’t. I put on a knit cap with a “headlamp” in it my SO uses, so people could see me and I could warn them off. With my arthritic hip, which I only recently revealed to my readers (not visually…just verbally 😉 ), putting on my left shoe is one of my biggest challenges each day. One of the things I’ll be doing with the internet today? Ordering “no-tie shoelaces” from Amazon. I used to go barefoot pretty much all the time, unless it wasn’t “legal” (and I use that term loosely). I remember being amused when somebody suggested to me that driving barefoot wasn’t safe…as if you could feel the pedals better through shoes! I used to go into Japantown to buy “tai chi shoes” for about $5 a pair. They had an elastic top and plastic bottoms, and counted as shoes if I had to go into a restaurant or something. That leads to one more story, then I’ll get to writing other things. Once, my SO had surgery. I went to pick up my SO and for some reason, I was in my SO’s car, rather than the one I usually drove. I think I wanted to have the bigger, more comfortable car. I got to the hospital and realized…I didn’t have any shoes! I kept a pair of tai chi shoes in my car, but not in this one. Well, I’ll give you a bit of my SO’s perspective. My SO saw me drive up and I should have been up to do the pick up in ten minutes or so…it was more than half an hour, which was puzzling.